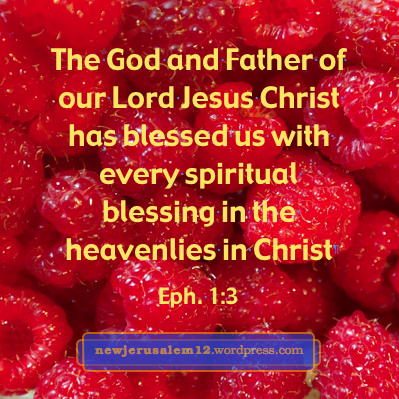 Ephesians 1:3: “Blessed be the God and Father of our Lord Jesus Christ, who has blessed us with every spiritual blessing in the heavenlies in Christ.” The spiritual blessings all lead to God’s glory (Eph. 1:6, 12, 14). Hence, they point towards New Jerusalem, God’s city of glory. These blessings are in three portions, each ending with the praise of His glory (Eph. 1:6, 12, 14). These blessings are “according to the good pleasure of His will” (v. 5) and “according to His good pleasure, which He purposed in Himself” (v. 9) and “according to the counsel of His will” (v. 11). These blessings relate to New Jerusalem because this city is the consummation all that God is doing according to the good pleasure of His will. Ephesians 1:4 says, “He chose us in Him before the foundation of the world to be holy and without blemish before Him in love.” God’s choosing of us was in eternity and it is for eternity, including the eternal city New Jerusalem. God chose us to be holy before Him. This is for the “holy city” (Rev. 21:2) where we will “see His face” (22:4). God’s choosing is also in love, for the eternal marriage of Christ and His bride, New Jerusalem (Rev. 21:2, 9). How wonderful that this one verse of blessings in Ephesians has so many pointers toward New Jerusalem. Lord Jesus, we love You!